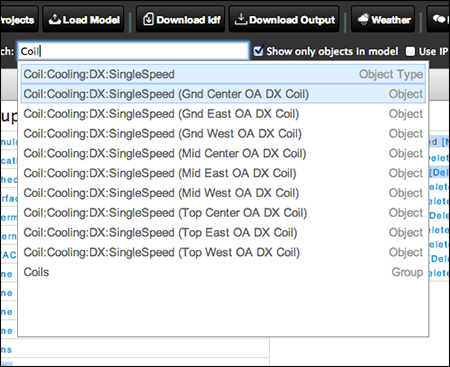 With rich graphical reports, collaboration, model versioning, HVAC graph editing, the ability to import both gbXML and IDF models, gEnergy is incredibly feature rich. The following gives an overview of some of the key features available in gEnergy. Don’t take our word for it though – Register now to try gEnergy out for yourself, or check out our gEnergy public showcase read only projects. Edit EnergyPlus models using detailed, but easy to use forms. Forms are linked allowing for easy navigation through objects in the model, this simplifies the process of viewing and editing large energy models. Objects can be duplicated, copied, pasted, imported from and saved to libraries. 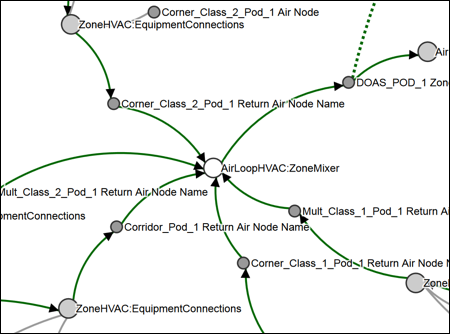 Visualise and edit systems using an interactive graph based editor showing components and connections in HVAC systems, e.g., air loops, water loops, etc. 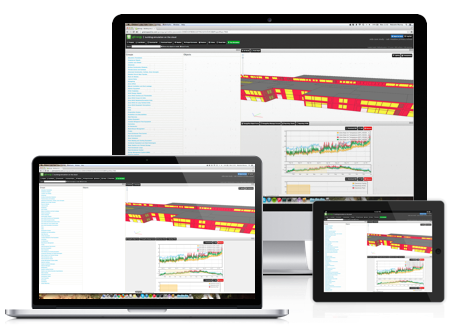 gEnergy’s interactive HVAC graph view can be used to highlight areas in a system, identify and analyse connections, and increase understanding of otherwise complex systems. 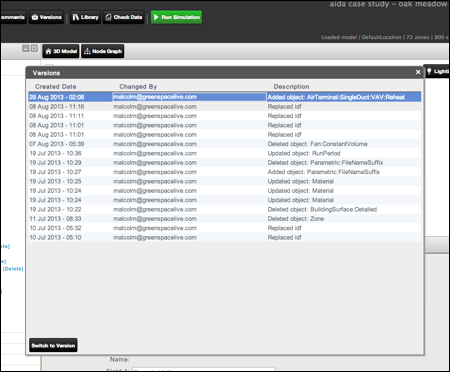 The graph is linked with the form editor, so that selected components can be edited directly. 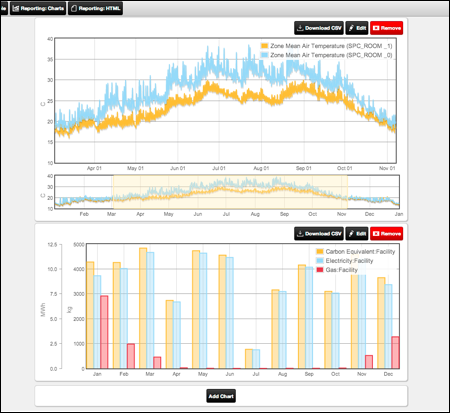 All simulation results can be exported and downloaded from gEnergy for further analysis in downstream tools, e.g. Microsoft Excel. 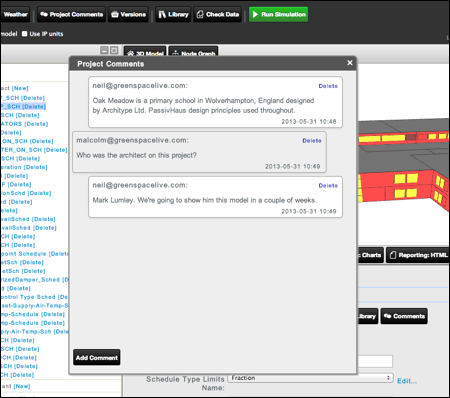 gEnergy supports collaboration by allowing users to share projects with others, and comment at project and object levels. 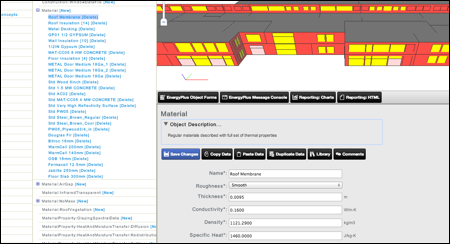 Import EnergyPlus IDF files from any source, this can include detailed geometry files from Trimble SketchUp using GreenspaceLive’s gModeller Plugin. Using gModeller, geometry can be imported into gEnergy from many Building Information Modelling tools, including Autodesk Revit, Graphisoft Archicad and many more. Pre existing EnergyPlus files can be imported for use in gEnergy, this means that existing work can be brought into gEnergy to be analysed, edited, and reported on the cloud and taking advantage of gEnergy’s additional functionality. EnergyPlus models can be large and complex, composed of many different objects. Often however, many objects share common attributes. For example, many surfaces may share the same constructions. gEnergy is a Web based application. This means that it can be used on any device that supports a Web browser. This includes Microsoft Windows, Mac OS X, Linux, iOS, Android, and other operating systems… gEnergy has been designed to work on large screened desktops, laptops, tablets and also works on smartphones. This makes gEnergy very portable, start modelling on a desktop, edit and run while on the move on a laptop and tablet, check results on a smartphone, and present results on a client’s computer. gEnergy comes with model versioning, every change made is backed up as a version, meaning data is never lost, even after changing a model. Versioning makes sure that regardless of how, or by whom, a model is changed, it is always possible to go back to a previous version. This can be extremely useful if the model has had errors or inaccurate data introduced. The ability to version also allows for model alternatives to be simulated and compared. For example, multiple constructions or systems can be used in two different versions of the same model to see how they compare. 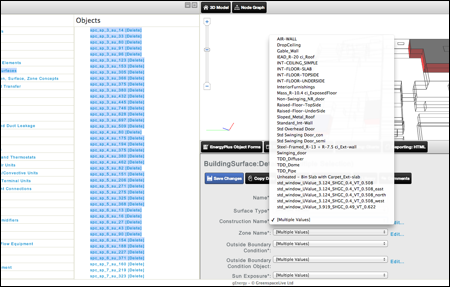 gEnergy features an extensive and extensible library of prepopulated building objects. Select and drop library objects into a model to begin using them. 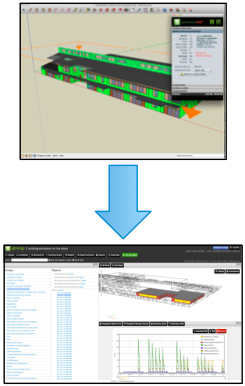 Using library files allows users to quickly populate models with prebuilt information. This can be standards based, or come from component manufacturers. gEnergy feratures a fast WebGL based 3D visualisation of building geometry. This is available in supporting browsers such as Google Chrome and Mozilla Firefox and allows for a fully interactive, hardware rendered 3D model. 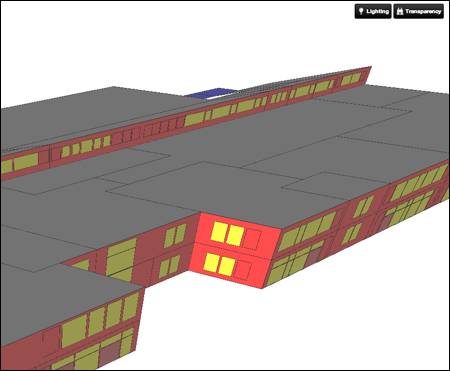 For browsers, that do not support WebGL, gEnergy automatically downscales to a canvas based 3D visualisation, so that a 3D model of the building’s geometry is always available. The 3D model is linked to the overall user interface, so that selecting a space in the object menu, highlights in the 3D model. This helps provide clarity when editing complex models. 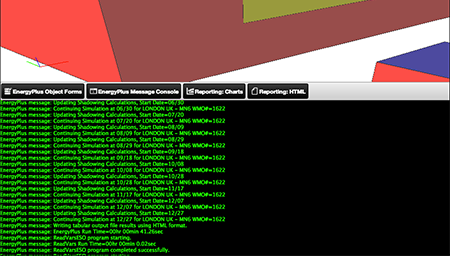 View EnergyPlus simulation output in a console as simulations are running on the server. This allows the user to view EnergyPlus output messages, identify any modelling errors, and be informed of any issues that take place during model simulation. Full EnergyPlus output can also be downloaded in order to be investigated in more detail, if necessary. 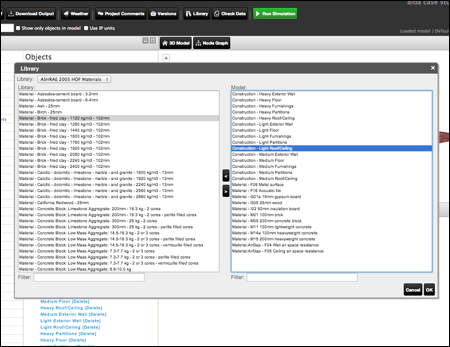 gEnergy provides custom editors for specific object types, this includes a graphical schedule editor for defining and editing schedule information. 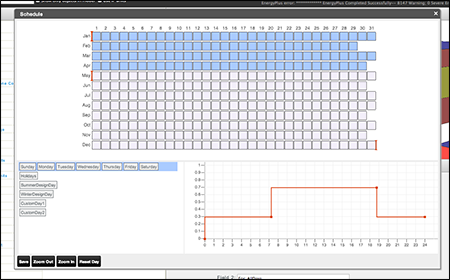 The graphical schedule editor allows users to easily create usage profiles and schedules using a draggable charting editor, drag and drop days, and selectable periods. Object search allows the entire model to be searched, this makes finding specific objects in a complex model as simple as searching for the object. gEnergy’s search box automatically suggests search terms in the model, this can be useful when looking for an object where the name or value is only partially known, saving significant time and effort. gEnergy also provides functionality for filtering out unnecessary, or unused objects in order to simplify the process of navigating complex models. Give gEnergy a try to find out more.